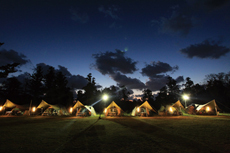 Click here for an introduction and top tips to Jeju camping from Mary Summmers. 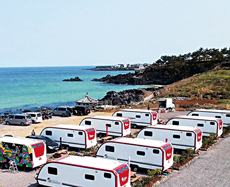 To read about Jeju's beach-side camping facilities see our beach guide here. Note: This former site of Samyang school has been redeveloped into a campsite, run by the Jeju Ecological City Research Center. 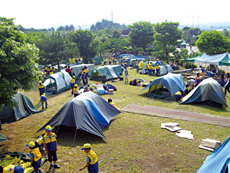 Tents can be pitched anywhere in the school grounds. 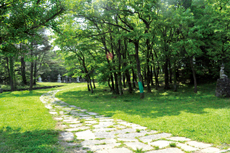 Nearby, Geomeun Orem and Hamdeok Beach are both recommended. Note: Lawn, wood, and ground campsites are available. Each site has lots of trees and plenty of shade. The altitude makes it cool in summer. It is possible to pitch 30 to 40 tents here and there is good hiking nearby. Contact: 064-756-9950y cool in summer. It is possible to pitch 30 to 40 tents here and there is good hiking nearby. Note: Although the site is near the airport, so it can be a little noisy during the day, on summer nights campers can enjoy the coastline, fishing and various sports facilities. Facilities: All facilities available except electricity. There is also an outdoor gym and small shop near the valley entrance. Note: In midsummer, locals like to bathe in the nearby river to both cool off and heal neuralgia. 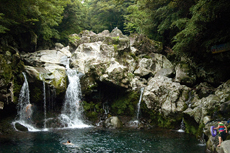 The water flows from Mt.Halla and is always refreshingly cool and clean. 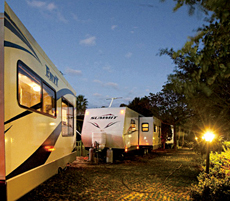 Note: This site suits group and family camping owing to the various leisure facilities. Seongsan Sunrise Peak and Shinyang Beach are nearby, as is Moguri Oreum for hiking. Note: This auto campsite is owned by a large tour company and is just 5 minutes from Gwakji Gwamul Beach. Facility: All facilities are available, plus a pension and barbeque facilities. Note: Known as the best luxury auto camper, guests can enloy a beautiful seaview from anywhere in the campsite. Facility: Campers and barbeque grills are available. 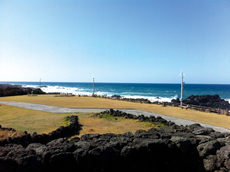 Note: Near to Seongsan Sunrise Peak, Pyoseon Beach, and a Jeju Olle, this site is surrounded by beautiful nature.